Originally called “setting spaniels,” English Setters were derived from spaniel stock. They were developed from a combination of Spring Spaniel, Spanish Pointer, and Water Spaniel by the two English breeders Edward Laverack and Richard Llewellin in the 1800s. English Setters were historically used as a gun dog, aiding hunters by “setting” birds, or pointing hunters towards copses of trees or bushes where birds were lurking. Modern English Setters still excel in this function but are more commonly seen competing in field, obedience, and agility trials. English Setters are widely renowned for their tolerant disposition. This is a dog breed that is gentle, affectionate, and patient towards all. Their personality traits have led them to be frequently and successfully used as therapy and guide dogs. English Setters thrive on companionship, making them excellent family dogs. English Setters are an intelligent breed that takes well to different types of dog training. English Setters should be enrolled in a puppy kindergarten class when they are brought home, and training should be continued afterward with an emphasis on obedience. Crate training is recommended from a young age. More advanced training, such as gun dog training, is a longer process that will require a specialized trainer. English Setters respond best to positive reinforcement training and a patient, caring owner. English Setters have a moderate to high energy level. They will need daily exercise in the form of a half-hour run or play session. Ensure your play area is fenced or keep your pup on a leash while they are running. 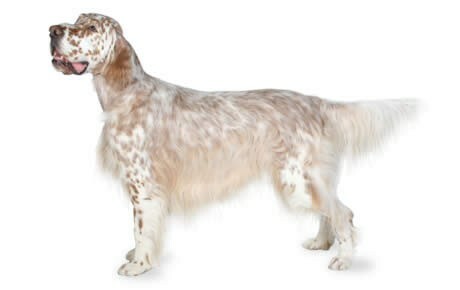 English Setters live up to 12 years old. English Setters are currently the 102nd most popular AKC registered breed. English Setters should be fed a high-quality food source that contains a balanced nutrition. This breed is prone to canine obesity if overfed, leading to a shorter lifespan, so be careful not to overfeed your pup. Consult with a veterinarian to determine the best food source for your English Setter that accommodates his weight and exercise levels. English Setters should be brushed two or three times a week and bathed every six weeks, as part of their grooming process. Their coat should be trimmed every six to eight weeks. Are English Setters Good With Kids? English Setters are excellent with kids of all ages. Young children should be taught to respect your dog, but English Setters pose no danger to children. They are gentle, affectionate, and caring towards children of all ages. Hip dysplasia in dogs is a condition that commonly affects a number of breeds, and is currently seen in about 24% of English Setters. Hip dysplasia is caused by a loose fit between the femur and pelvis in the rear hip assembly. The loose fit in this ball-and-socket joint causes the cartilage padding these two bones to wear down unevenly over time. This uneven wear results in the buildup of scar tissue and leads to arthritis, bone spurs, and even lameness in the rear legs. Hip dysplasia is believed to be the result of heredity, exercise, and nutrition, although the exact causes are still not understood. English Setters are prone towards suffering from elbow dysplasia, a painful condition that affects the front limbs. Elbow dysplasia in dogs occurs from a malformation between the elbow and wrist, or radius and ulna, in the front legs. This malformation causes the cartilage to wear down unevenly, eventually resulting in canine lameness in the front limbs. Unlike hip dysplasia, elbow dysplasia presents at a much younger age. Elbow dysplasia can be diagnosed through an x-ray of the front legs. Hypothyroidism in dogs is a condition where the thyroid fails to produce a sufficient amount of the hormone thyroxine. This hormone is critical for regulating metabolic function in the body. Dogs suffering from hypothyroidism will exhibit signs of decreased metabolic activity. Typically, these signs include weight gain, low energy levels, a slow heart rate, excessive shedding or skin problems, and a heightened intolerance to cold.